The Missouri House Speaker is praising the bipartisan seven-member House committee that’s investigating Governor Eric Greitens’ indictment. The House Special Investigative Committee on Oversight issued a 24-page report late Wednesday afternoon in Jefferson City. All seven members of the committee, five Republicans and two Democrats, signed the report. Speaker Todd Richardson, R-Poplar Bluff, tells the Capitol Press Corps the committee’s job was not to make their own conclusions, but to hear testimony and judge the credibility of witnesses. “Let me be very clear about this: this is not a witch hunt, and the committee had no political agenda,” Richardson says. Speaker Richardson says the committee “repeatedly” gave Greitens an opportunity to testify, adding that the invitation remains open. “The committee’s task, and its only task, was to conduct the fairest, the most thorough and timely investigation possible,” says Richardson. The Speaker says the committee will be unable to make recommendations to the Legislature before the 2018 session ends on May 18. 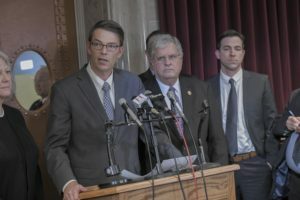 “With the limited time left for the General Assembly to complete the work Missourians sent us to Jefferson City to do, Chairman (Jay) Barnes and the members of the committee have work remaining,” Richardson says. Richardson says he and Senate President Pro Tem Ron Richard, R-Joplin, support a special session, regarding recommendations. Greitens notes the committee held its meetings behind closed doors, where his representatives and the news media could not attend. House Minority Leader Gail McCann Beatty, D-Kansas City, is blasting the comments Greitens made to the Capitol Press Corps. 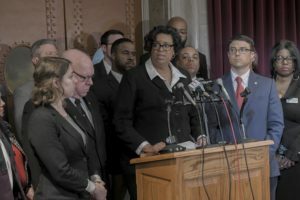 “After taking a little time to process the initial committee report and then listening to the governor’s comments, it is clear to me that this governor must resign and if he fails to do so, I believe we should begin impeachment proceedings,” says Beatty. Speaker Richardson says the report does not pass judgment on Greitens’ guilt or innocence in the St. Louis case, adding that’s for the courts and a jury to decide. 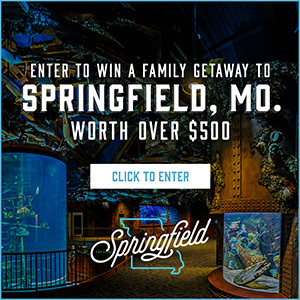 A St. Louis City grand jury has indicted Greitens for one felony count of invasion of privacy, and his jury trial is scheduled to begin on May 14th in downtown St. Louis. Greitens’ lawyer, former U.S. Attorney Edward Dowd, has said that the release of any report before the May trial date in St. Louis would impact Greitens’ ability to obtain a fair trial. The committee was appointed in late February.